The Service Plan covers everything required in the manufacturer's scheduled maintenance program and includes parts, labour and fluids as required. Normal wear-and-tear items, such as brake pads, windscreen wipers or tyres are excluded. All servicing included in the Service Plan must be carried out by an authorised Subaru Service Centre giving you the peace of mind that work on your new Subaru BRZ will be carried out to the high standards of factory trained Subaru Technicians. Our network of authorised Service Centres are also required to only use Subaru Genuine Parts in the servicing of your new Subaru BRZ. The Service Plan can be claimed at any authorised Subaru Service Centre across Australia. 1. What is covered under the Subaru BRZ 3-year/60,000km Service Plan? The Subaru BRZ 3-year/60,000km Service Plan covers all items specified under the standard 'Maintenance Schedule for Normal Driving Conditions' detailed in the Warranty and Service Handbook. This includes inspection and adjustment of all items listed, genuine parts, labour and fluids required for each standard scheduled service. For items not covered under the Service Plan, see section 7 below. 2. When does the Subaru BRZ 3-year/60,000km Service Plan Term of Coverage commence? The Service Plan Term of Coverage commences on the original registration of warranty date for your Subaru BRZ as recorded in the Warranty and Service Handbook. 3. When does the Subaru BRZ 3-year/60,000km Service Plan Term of Coverage expire? c. The date upon which your Subaru BRZ has travelled 63,000km or more. For information on servicing costs outside of these standard scheduled services (which will be dependent on your driving conditions) or after the Service Plan Term of Coverage expires, please consult your authorised Subaru Service Centre. 4. What is the due date for each service and when should services be carried out? The recommended service intervals specified in your Subaru BRZ’s Warranty and Service Handbook are for the earlier of a given distance or period of time. Your Subaru BRZ should be serviced every 9-months/15,000km, whichever occurs first. Even if you don't drive far enough to cover the distance between recommended time-based service intervals your Subaru BRZ should still be serviced according to the time period shown on the schedule in your Subaru BRZ’s Warranty and Service Handbook. Conversely, if you travel the distance between recommended kilometre-based service in a period shorter than the recommended time based intervals, your Subaru BRZ should still be serviced according to the recommended kilometre-based intervals shown in you Subaru BRZ’s Warranty and Service Handbook. 5. Claim periods for Subaru BRZ 3-year/60,000mm Service Plan. 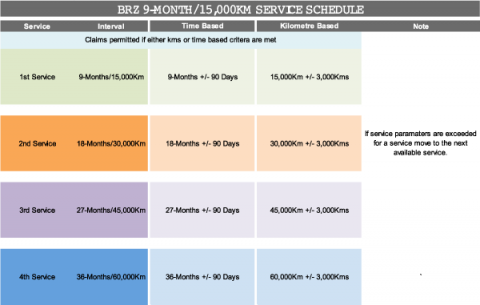 Each service under the Service Plan can be claimed within a nominated number of months or kilometres of the due date for service (for “due date for each service” see section 4 above together with the table below). Please note that when the service claim period expires, the next service period will then be available. Note: Eligible Services can be claimed by either time based or kilometer based schedules. You cannot claim both a specified distance service and the corresponding time period service separately. Up to a total of four (4) scheduled services may be claimed. No claims are permitted beyond 39 months/63,000kms (which ever occurs first). 6. Where can BRZ 3-Year/60,000Km Service Plan be carried out? Servicing under the Service Plan can only be redeemed at authorised Subaru Service Centres within Australia.You must present your updated Warranty and Service Handbook at the time of an eligible service to redeem a service under this Service Plan.To avoid any problems in redeeming your service(s) we recommend that you keep your Warranty and Service Handbook in a safe place. You should ensure that your Warranty and Service Handbook is appropriately stamped and signed by the servicing authorised Subaru Service Centre on the completion of each service redeemed under this Service Plan. NB Failure to do so may render your plan void. 7. What is not covered under BRZ 3-Year/60,000Km Service Plan? Additional 'Maintenance for Severe Driving Conditions' scheduled service requirements. Additional maintenance and repairs (over and above that specified in the Warranty and Service Handbook) that may be recommended by your Subaru Service Centre to suit your particular driving style and/or conditions. For more information please refer to the “Maintenance and Service” section in your Owners Manual as well as the Service Schedules in you Warranty and Service Handbook. 8. Transfer of BRZ 3-Year/60,000Km Service Plan. The BRZ 3-Year/60,000Km Service Plan runs with your BRZ for the Term of Coverage and cannot be transferred to any other vehicle. Subsequent owners of your BRZ will be entitled to claim any unredeemed services under the Service Plan, provided the new owner complies with these terms and conditions and that the Term of Coverage has not yet expired (for the “Term of Coverage” of this Service Plan see sections 2 and 3 above).To do so the new owner merely needs to present the updated Warranty and Service Handbook specific to your BRZ at the time of service. No credit, refund or other consideration is payable to an owner or any other person in respect of an eligible vehicle for any services under this Service Plan which are not claimed specifically in accordance with these terms and conditions. Government, Rental, Fleet and Not For Profit vehicles are not eligible to receive the benefits under the BRZ 3 Year/60,000 km Service Plan and additional exclusions may apply.